Anthony Tersigni, the CEO of Ascension, oversees a sprawling empire of 141 Catholic hospitals in 24 states and the District of Columbia with 150,000 employees over 2,500 care sites. At a time of potentially far-reaching political changes, the $21 billion organization is going through its own transition, having recently tapped Chief Operating Officer Patricia Maryland to succeed Robert Henkel as CEO of Ascension Health, the holding company's largest operating division. 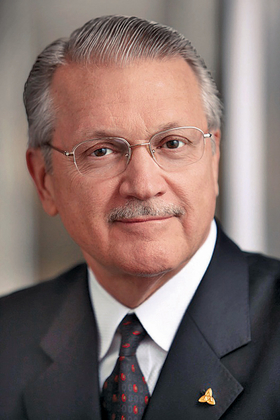 During January's J.P. Morgan Healthcare Conference in San Francisco, Modern Healthcare finance reporter Dave Barkholz spoke with Tersigni about the drama in Washington over repealing and replacing the Affordable Care Act, what the nation's largest not-for-profit healthcare group has planned regarding mergers and acquisitions and the transition underway at Ascension. The following is an edited transcript. Modern Healthcare: Have hospitals muted their voices in speaking out about a replacement for the Affordable Care Act? I fully understand they're going to repeal and replace. I'm a big boy. So we say, “OK, let us help you by being a resource.” That's really how I'd like people to view Ascension in this healthcare debate—as a resource. We are a microcosm of the American healthcare system. If somebody has a policy idea, we can let them know what the implications of that policy idea are for taking care of patients. MH: How much would Ascension be hurt by a repeal only of the ACA? Tersigni: When you say repeal, I don't know what that means with all of the fine points of what happens in the repeal. That's what I'm talking about in terms of us advocating for certain specific things. For example, we advocate for accessible and affordable care. Our slogan is we want 100% access, 100% coverage for every man, woman and child in this country. That's something that society should support. We believe accomplishing mental and behavioral health reform is very important. We've made some inroads in that regard. This is very important because the No. 1 concern from our primary-care physicians is what they can do when somebody presents themselves in their office with a mental/behavioral issue. Where do they refer them to? We've begun to use tele-behavioral medicine to focus in that area. The other thing we're passionate about is removing barriers to the integration of federal programs that address social determinants of health. When we look at a patient who presents in a hospital setting, many times their health is related to something other than healthcare. We'd like President Trump to establish a task force of these various agency leaders, together with consumers and providers, to figure out if there are ways for us to integrate the efforts so that people stop falling through the cracks. MH: Turning to M&A activity, the not-for-profits are leading the way right now, while some of the for-profits are actually divesting. Have we seen the shift where M&A is now more of a strategic play than a financial play? Tersigni: It's always been a strategic play for us. When you look at our system, any acquisition is really dilutive from a financial perspective. We believe that we have the wherewithal to bring the services necessary to make those facilities more efficient. If you look at our most recent acquisition, Wheaton Franciscan in Wisconsin, you'll see we've always had a good presence in Wisconsin. Wheaton just makes it much more robust for us to care for that population. That was a strategic play, not a financial play. MH: How does it make you more robust having them in the system? Tersigni: There are clearly more access points and the level of services available in that community is greater. Because if we're moving toward fee-for-value and we're moving to population health, it's important to us to have that. MH: But you also divested a couple of hospitals. Tersigni: We go through a process we call ministry configuration. It's a portfolio analysis. We look at our assets and we look at whether we are really providing value to that asset in that community. Or, is there a better partner for that? You have to be mature about this, and you've got to be humble about admitting that, even though we're the biggest nonprofit in the country, we may not be able to provide the necessary assistance. A perfect example is what we did in Tucson. We own three hospitals there. They were struggling. Tenet was in the market. Dignity is in that market. We came to the conclusion that the community could be better served by a different structure. So we created a partnership with Tenet and Dignity, with Tenet as the managing partner. Those three hospitals will survive and thrive. MH: Given the ongoing talks between Dignity and Catholic Health Initiatives, is Ascension going to play a role in furthering the consolidation of Catholic healthcare systems? MH: What are your top priorities right now? Tersigni: We're clearly continuing to move to fee-for-value, which means we have to continuously grow, cover lives and focus on our capabilities for assuming risk. That's an area where we believe we're going to have to partner with somebody who really understands risk. Many of us tried it in the '90s when managed care was here and many of us lost our shirts because we truly didn't understand risk. We have three choices. We can build it ourselves; we can buy it; or partner it. And my position is, when it comes to the risk side, you've got to partner. These insurance companies have put a lot into understanding risk and being able to identify it. I don't want to replace Aetna or Anthem. My intent is to partner so that we can, in fact, take care of defined populations. MH: Will you continue to buy physician practices? Tersigni: We let the market drive. We're in 20 states and the District of Columbia, but our employed physicians are only in 16. We know that the primary-care physician is critical to the continuum of care. So we continue to look at the market dynamic to see if buying practices is appropriate. Tersigni: The other big priority for us is to enhance behavioral/mental health. The last piece is really to prove our value by continuing to lower our costs. We're going to take cost out of that structure that's pure overhead. We're branding ourselves as one Ascension throughout the country starting in Michigan and Wisconsin. We're branding ourselves as a national system that really wants to provide services to national employers. The minute you move into that area, you can't have variance in quality, cost, or outcomes. And so, this is a path that our clinicians have been on for the last couple of years. They have done a great job in developing evidence-based protocols. We're beginning to look at how to take that across the country. MH: Can you talk about moving the Rev. Dennis Holtschneider, the president of DePaul University, from his post as Ascension board chairman to an executive position? Anthony Tersigni: Father Dennis is going to come in as chief operations officer and is going to be responsible for our Ministry Service Center, which is our enterprise resource-planning system, our information technology operation strategy, and advocacy. I've been so impressed with Dennis and his passion for the poor and what he's done at the university. He's a very creative, entrepreneurial individual. MH: It must be hard to replace someone like Bob Henkel, who spent decades with Ascension and before that Daughters of Charity. Tersigni: He and Pat (Maryland) are working very closely together in transitioning. Over the last three or four years, Ascension has really focused on succession planning. We started with my office of the president. Every member of the office of the president has worked hard over the last three years to identify immediate successors in case something happened to them. As you know, healthcare is often slow to come to a party, and in succession planning, healthcare hasn't done it as well as other major industries. So we're really pleased where we are today. We've been grooming Pat to take Bob's place since she got to Ascension corporate.